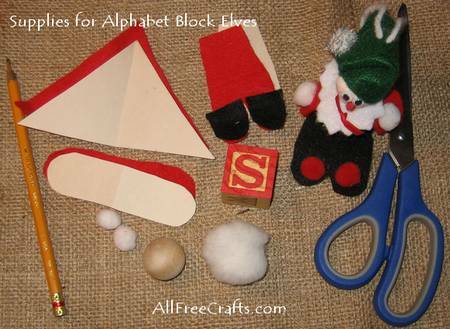 Turn alphabet blocks into an adorable elf or Santa; either would love to sit in your Christmas tree or watch the holiday festivities from your bookshelf. 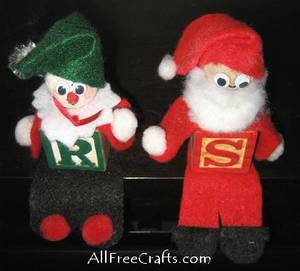 If you cut out the felt pattern pieces ahead of time, even younger children can enjoy gluing the elf parts to the alphabet blocks. You will also need a computer and printer, a pencil, and a pair of scissors. a. Cut an arm piece from red felt for each elf. b. Cut legs and a hat from red felt for Santa. Cut legs and a hat from black or green felt for an elf. c. To make Santa’s boots, cut two pieces of black felt to fit on the ends of the leg pattern, then glue in place. 2) For Santa, put a generous coating of glue on the bottom of the red and white alphabet block and set it firmly onto the wide end of the red leg piece. For the elf, repeat these steps with the green and white alphabet block and black or green leg piece. 3. Glue two small white pompoms to the two ends of an arm piece. Apply a good coat of glue on top of an alphabet block then center the arm piece on top and press it down until the glue holds it in place. 4. 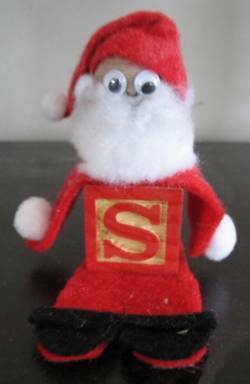 For the elf, cut a small white circle of felt as a collar. You could cut around the edge of the collar with pinking shears if you like to give a frilly effect. Glue the collar in place on top of the arms, as shown in the photo at the top of the page. 5. 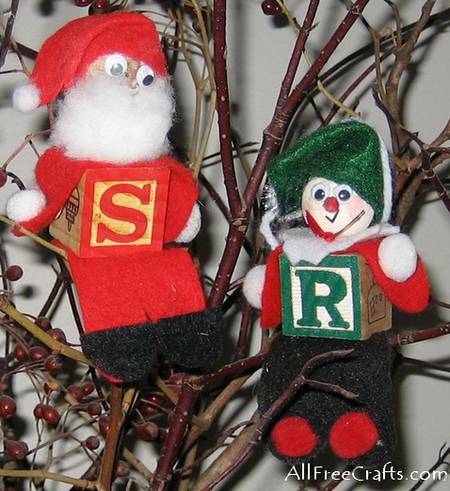 For Santa, flatten a two inch white pompom with your fingers and glue it on top of the arms, as shown in the photo (above, right) of an alphabet block Santa, partially assembled. 6. Paint the wooden balls in flesh colored acrylic paint. Once the paint is dry, glue on a pair of plastic, movable eyes. Below the eyes, draw a simple round nose and a small smiling mouth with permanent marker. 7. Avoiding the face area, hold the ball upright and apply glue to the top and around the back. Take one corner of the hat triangle and press it into the glue at the back. Carefully smooth the bottom edge of the triangle over the top of the face and around to the back, overlapping the first glued down corner. Hold it in place until the glue sets enough to hold it for you. Take the part of the hat that is sticking up and fold it over to one side. Apply glue to the underside of this fold and press it down until the glue sticks. Glue a small white pompom to the end of the hat. 8. 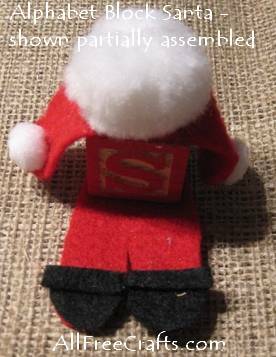 Apply glue to the bottom of the Santa head and press it into the beard pompom already glued on to the block. The pompom will usually not cover all of the face. If it doesn’t, cut a little of the pompom fibres from the back of the pompom, apply a line of glue to the bottom of Santa’s face, and press the fibres into the glue to finish Santa’s beard. 9. For the elf, just glue the head on top of the white collar. 10. Now the fun begins: sit your elves on the shelves or perch them on the Christmas tree. But don’t be surprised if they move around. Mine keep popping up in the most surprising places. I’m not sure if my daughter helped them get into the bathroom medicine cabinet, but there they were when I went to brush my teeth one morning.